This established vacation home has been helping families make memories for years. Make yours today! 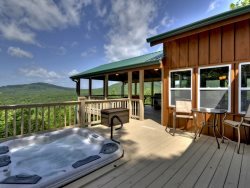 Located in Mineral Bluff, just north of Downtown Blue Ridge, you will find it easy to make yourself at home in Papa Bear's Den. Walk into the main level living area and immediately notice the fine artistic touches the builder made when designing the cabin. When you're not cuddled up on the couch watching a movie on the 42" flat panel TV, enjoy views of the mountain range and rolling hills from the living room and the adjoining deck. Find some time out of your busy vacation schedule to soak in the sunken hot tub and breath in the fresh air. While you're outside, take a moment to appreciate the outdoors and gather around the fire pit, or if you're in the mood for something a little more intimate, the outdoor fireplace. Don't forget the outdoor furniture on both the upper and lower level decks, where you can indulge in some quiet time or swing in the seasonal breeze that only the mountains can offer. Come back inside to the well-equipped kitchen perfect for making your favorite homemade meals, even when you're not at home. The nearby dining area makes dinner time pleasant and easy for everyone. After mealtime, join the family downstairs for a game of pool. If you're more into curling up to your favorite TV shows, you'll love the 50" flat panel TV located in the basement level game-room, which also includes plenty of comfy seating. When bedtime rolls around, wind down in a cozy bed, whichever bedroom you choose you'll find the comfort you need, especially after a long day of adventuring and sightseeing. Call today to book your future stay at Papa Bear's Den. Master bedroom has a king bed, 20" Flat Panel TV, private balcony and bathroom with jetted tub and walk-in stone tile shower. I loved the best in the living room, the private balcony in the master bedroom, the view and the pool table was a pleasant surprise! There was an air hockey table on the photos online.... Definitely preferred the pool table. Office very nice and helpful. Always beautiful cabins. Great cabin. Loved the views! The members of your team were all professional, pleasant and knowledgeable. The office staff is always friendly and very accommodating! This was such a wonderful time together with all our kids and grandkids! So many wonderful memories Such a great place for us all to be together. Staff is very friendly and knowledgeable of the area. Will do all they can to make your stay wonderful. This property was older. Could use a bit of updating, especially in the kitchen. It did meet our needs from having 5 bedrooms, lots of outdoor entertaining space. enjoyed every day we were there. Each time I spoke with someone on the phone in preparation for my trip they were very courteous and helpful. When I arrived for check-in, Kim was very efficient and accomodating. Information given was accurate and beneficial. Upon arrival to the cabin, we discovered the downstairs bathroom sink was clogged and Kim sent out housekeeping to clear it within an hour of my call. The staff I worked with were wonderful. The property was clean and the location was perfect for our family. We especially enjoyed the outside fireplace and the fire pit. We brought wood for the fire pit as was instructed, but the property was well-stocked for the house fireplace. The beds were all comfortable. The only complaint is that the downstairs recliners in the game room were old and uncomfortable, but very little time was spent there so it didn't really matter. The kitchen was well stocked with what we needed for making meals. The pantry shelves were a plus for providing storage for what we brought. The cabin decor was delightful and gave it a real mountain cabin feel. Everyone I spoke to was friendly, pleasant, and helpful. I would recommend, however, that they should be very knowledgeable about the details of all of the properties, as misinformation can be very disappointing. The girls and their father and uncle enjoyed the game room. The girls also enjoyed their 'private suite' at the top. Papa liked his room and the close proximity of the bathroom, kitchen, and living area; he was very comfortable. At 94 years of age, this is important to us! Everyone was friendly, knowledgeable and accommodating to our questions. Absolutely the best cabin we have rented. Excellent amenities. Beautiful views. We have rented condos, cabins,etc... in various places.. This cabin had the most and best stocked kitchen , linens etc. of all our stays. We loved it. We had 10 people and plenty of space to separate and enjoy time. Thank you so much. we look forward to vacationing with you again.